I have really enjoyed Fox's latest post about front-side/back-side tatting and the responses received. So I decided to tat this little motif called "Backchat" by Mary Konior (from the book Tatting Patterns) which is actually two motifs mirrored, making one in regular tatting and the other in fs/bs tatting. Oh no! This challenge ended too quickly! I'll stick to what I've always done. I agree with Carol... it does make a lovely necklace! I also agree with you... stick with what works for you. There's no reason for all of us to do exactly the same thing. Just think how boring that would be! The necklace is great, and the words are even better! Whatever works! Traditional tatting on the right? Honestly, looking at it on the photo now, I'm not sure which side is which!! Your reply could not have been more appropriate! Of course! Amazing how just inverting a motif changes the look of it completely! Very pretty. Since you asked, I think I would attach the chain only to the end jump rings and dangle a charm or a bead from the middle one. 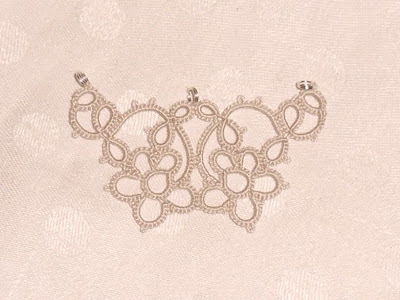 The line of chain above the tatting detracts from the graceful curve of the motif. I actually agree with you Suzanne. It's not quite right hanging like that but I like the idea and might play with it to come up with a design that has a steeper curve to fit better. 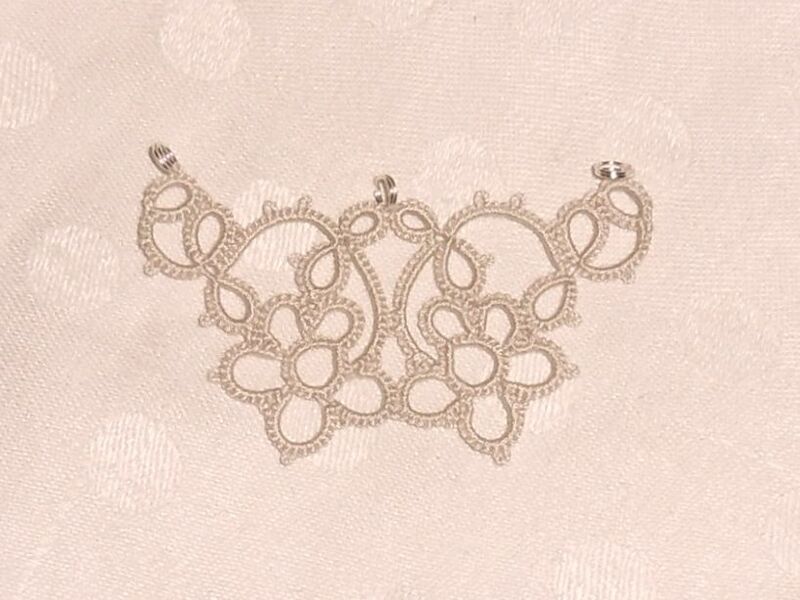 I had a motif that I put on a necklace, and I should have attached in the center like you have, because it pulled at the tatting and stretched it out by only be connected on the sides. But I agree (with Suzanne) that it does look odd with the straight chain. 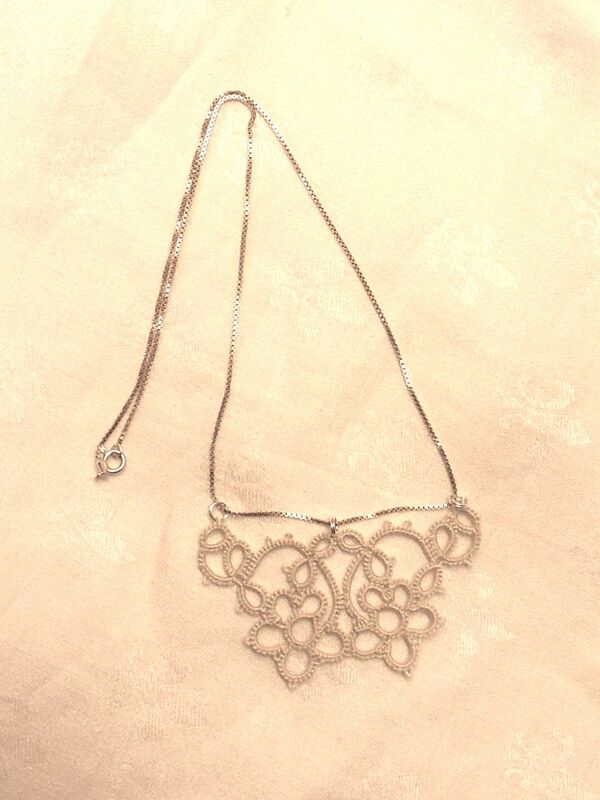 Could you attach it somehow at the bottom the motif, which would put the entire thing inside the necklace's frame, instead of dangling from it? That way it could be supported, but you still get the curve? I understand your idea Jess but in practice, you'd need a rigid chain for it to keep the shape around the motif. Nice idea though, something to keep in mind. I don't know why you are blaming yourself, it makes a lovely necklace and looks ok to me, your tatting is always of a high standard, a standard we all strive to get to. I have all mayr's book so I must find this pattern and try it, as it looks as always good. As others have stated your work is lovely. The necklace is beautiful and such a wonderful idea using the pattern as you did. You always give me inspiration and for that, I thank you. your 25th pattern is perfect! Will you make a new challenge? Avez-vous un blog? Je vais aller voir sur le site du 25-motif challenge. Oui, si je peux, je recommencerais bien un autre "défi-frivolité" moi aussi! I'm still a newbie so I had not heard of this style until you and Fox brought it up, but I really will have to give it a try! Nice idea to double the pattern, Frivole! Beautiful! I will see at the next show, how other german tatters think about that fs/bs thing, even heard about???. ..
By the way, frivole, did you see the peacock somebody tated in intatters picture gallery? Upstandig? Yes, thank you, I did see the peacock with the fanned tail, very nice, and I plan to make it myself. I have many things on my "to-do" list but the other peacock is definitely on there!